And here's the graph of Portugal in Portugal vs. Turkey, which Portugal won 2-0. 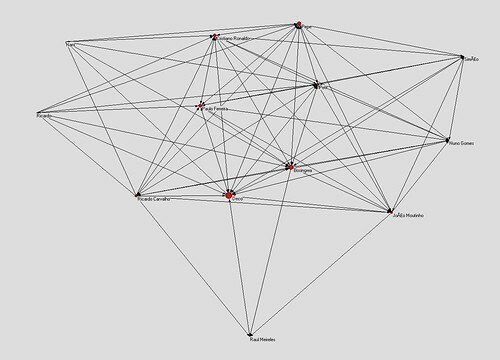 Nodes are sized according to betweenness: as you see, Deco is the betweenness king, the game organizer, right as it should be. Bosingwa and Pepe are also good organizers, while Cristiano Ronaldo is not really there. You can download the file from the git repository directly or create your own with the programs provided. And good luck!